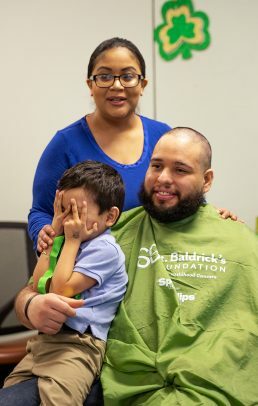 Eleven people shaved their heads to raise awareness — and money — for cancer research at an event hosted by the UI Health pediatrics department, known as the Children’s Hospital University of Illinois, on Feb. 22. Among the participants were family members of those touched by cancer, like Rafael Felix, whose 4-year-old son, Isaac, is a cancer survivor. Members of the community and hospital staff, like Karen Fischer and Dave Dreyfus, also attended. Fischer, a surgical nurse who has shaved her head each year for 10 years, was the top fundraiser this year. She raised around $1,800. “I do it for the kids,” she said. “They are way braver than I am. “It’s funny. When you have a bald head, people look at you differently — they don’t know if you are sick or why your head is bald. People notice,” Fischer said. And that is part of the goal, said Dr. Mary Lou Schmidt, professor of pediatrics and head of pediatric hematology and oncology. “We’ve been hosting this event, which supports the St. Baldrick’s Foundation, since 2007. The money raised is so important for advancing cancer research and the awareness the event generates makes a big difference as well,” Schmidt said. The hospital, and the Children’s Oncology Group — a collaboration between UIC, Rush and Stroger — has received more than $2 million in grant funding from the foundation since 2006. Childhood cancer affects about 1 in every 285 children in the U.S. In 80 percent of cases, children are diagnosed after cancer has spread. Johnathan was 13 when he passed away from metastatic alveolar rhabdomyosarcoma in November. He had been diagnosed just 15 months earlier. “For every heartbreak we carry with us, there is a story of hope. Our fundraiser today is about hope,” Schmidt said. The single-day event raised nearly $7,000.